Years ago I remember being in New Orleans and visiting a store that had rows, and rows. And rows. Of TABASCO® Original Red hot sauce on the shelves. The reason: it was the headquarters store for the sauce. The McIlhenny family introduced the Mexican chile to the plantations of Louisiana back in 1868. Mr. McIlhenny began experimenting with the sauce. And began to sell it. And sell it. And sell it. And now it’s on shelves all over, and likely in your fridge! Now I wish I’d had the chance to visit the factory at Avery Island while I was in the area! 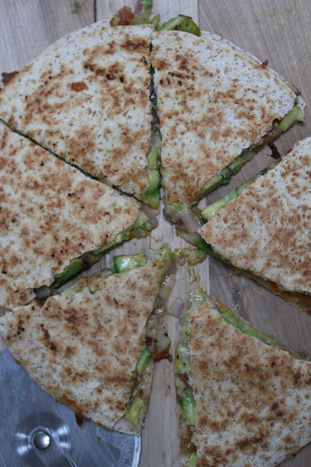 I have created a masterpiece of a quesadilla here for you. TABASCO® Original Red hot sauce! 1. In a large mixing bowl, toss together the diced avocados (don’t smash the avocado), diced tomatoes, chopped red onion, lime juice, cilantro, ground cumin, TABASCO® Original Red hot sauce and a few dashes of salt and pepper. 2. Lay 4 of the tortillas out on a clean surface. 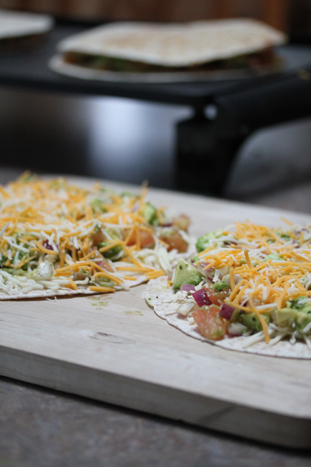 Sprinkle a little of the Monterey Jack cheese on each of the tortillas. Divide the avocado mixture evenly over the tortillas. Top with the Mexican blend cheese. Add the other 4 tortillas on top. 3. Heat an electric gridle over medium heat and warm the quesadillas on each side for abou 6-8 minutes. 4. Cut with a pizza slice and serve to your hungry self and/or your hungry guests! It’s okay if you let yourself have an entire one to yourself. This could be a meal too. Not just a scrumptious Super Bowl Snack! 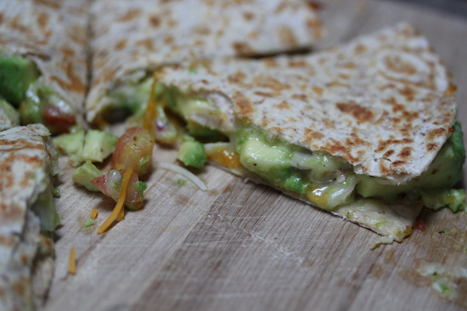 After you decide to make these melt in your mouth guac-adillas, be sure to head on over and check out the rest of the Game-Day Party Menu. And what’s even better…you can spend less the next time you want to purchase a bottle of TABASCO® Original Red, you can print off a $.50/1 coupon of TABASCO® Original Red!!! Oh, now that just looks heavenly – I’m putting the ingredients on my list for this weekend! You should have taken the time to go to Avery Island. It’s amazing-that those few simple ingredients make such a distinct sauce, and the whole island smells like Tabasco-all the time. Anytime friends/family come into town, I drag them there! Thanks for the recipe. oh, yum! Avocado and guacamole are some of my favorite foods! I can’t wait to make this! How do you flip those quac-adillas? I seem to always lose half of the stuffing when I flip them!